Decorative Area Rugs, Oriental Rugs, and Braided Rugs. Pelletier Rug Co., Inc. offers all the area rugs you need to make your room warm, inviting, and absolutely beautiful. Common Question: What size rug do I need? Common Question: What size hallway runner do I need? Transitional, and contemporary designs match today's decor. 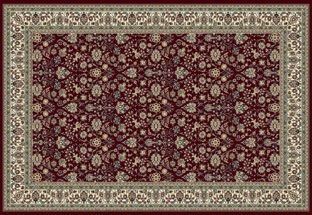 Traditional designs for lower cost than hand-knotted. Braided rugs are a traditional Colonial era rug. 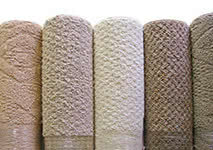 Sisal Rugs offer natural decor. Genuine hand-knotted oriental rugs offer one-of-a-kind charm. 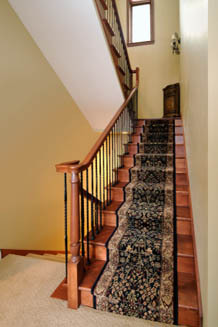 Extensive selection of stair runners and carpet. How to be prepared for rug shopping. Know what range of sizes you can use. If you know only your "perfect" size and a rug you like doesn't come in exactly that size, you have to go home to remeasure. But if you know the minimum and maximum sizes you can use, you'll know right away if you can use a rug. Take pictures. Take some pictures of your area with your phone. That will give us a much better idea of the look and feel of your room. Be open minded. It is far better to be open minded, find 5 rugs you like, and whittle it down to the best one. If your vision is too specific, you may be frustrated by never finding a rug. We've run across the occasional client that was looking for a rug for a room for ten years! It would have been far better to have chosen a rug right away than to leave a room undecorated for ten years. Then if you found the "perfect" rug ten years later, rejoice! And fabric swatches or a pillow are always helpful too. What types of area rugs can you find at Pelletier Rug? In our beautiful area rug showroom you will find: bound area rugs, wool rugs, oriental rugs, hand-knotted rugs, sisal rugs, braided rugs, hooked rugs, border rugs, traditional rugs, contemporary rugs, rug runners, and stair runners. 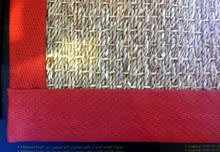 You'll find kitchen rugs, living room rugs, bedroom rugs, hall rugs, entry rugs, and stair carpet. If you want your home to be beautiful, we have a rug for you! What are common rug sizes? 2 x 8 Most common runner size. 3 x 5 Accent and Foyer. 5 x 8 Use to make a sitting area. 6 x 9 Use to make a sitting area. 8 x 10 Room size. Most common dining room size. 9 x 12 Room size. 10 x 13 Palace Size (sometimes called oversize). Most rugs will not come in all these sizes. Nor will they come in exactly these sizes. But this should give you a good idea what to expect. Some rugs can be custom sized. We can help you get just the size you want.